[Ponytail is standing in front of a boardroom, holding a stick up to the board. Cueball, Megan and Hairbun are in the audience, sitting at a long table; an extra, unoccupied chair is in the front.] Ponytail: My body hosts an autonomous microscopic defensive swarm that will do anything to protect me. Ponytail: I have no ability to restrain it and I don't know my own power. Ponytail: So listen up. 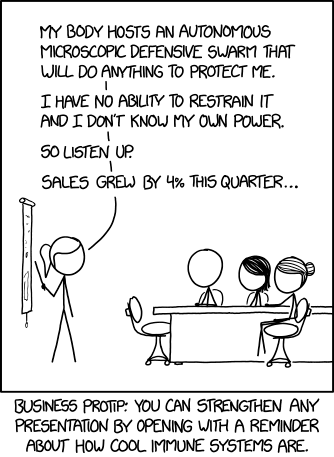 Ponytail: Sales grew by 4% this quarter... [Caption below the panel:] Business protip: You can strengthen any presentation by opening with a reminder about how cool immune systems are. It also helps with negotiation. "Look, if it were up to me, *I'd* accept your offer, but my swarm of autonomous killer cells literally can't be reasoned with. It's out of my hands!"